For the first time, researchers have pinpointed one source of fast radio bursts (FRBs), very brief flashes of energy from space that can generate as much energy as 500 million suns. Because FRBs are only found emanating from places billions of light-years away, understanding them could provide valuable insight into the distant history of our universe. The possibility that someone out there is trying to communicate with us has led to various efforts to analyze sounds produced by our universe. Of these sounds, fast radio bursts (FRBs) are one of the most intriguing types. Discovered only rather recently, FRBs, or "cosmic whistles," are flashes of energy - radio chirps - that exist for just a few milliseconds at a time but can generate as much energy as 500 million suns. To date, fewer than 20 of these FRBs have been picked up, but scientists didn't quite know what or who caused them - until now. Using a global network of powerful telescopes, a team of astronomers finally managed to pinpoint one of the sources of these highly unusual signals from space. Their study, which is published in multiple papers in Nature (A Direct Localization of a Fast Radio Burst and its Host) and the Astrophysical Journal Letters (The Repeating Fast Radio Burst FRB 121102 as Seen on Milliarcsecond Angular Scales), describes how they were able to identify an FRB coming from a dwarf galaxy that's about three billion light-years away. 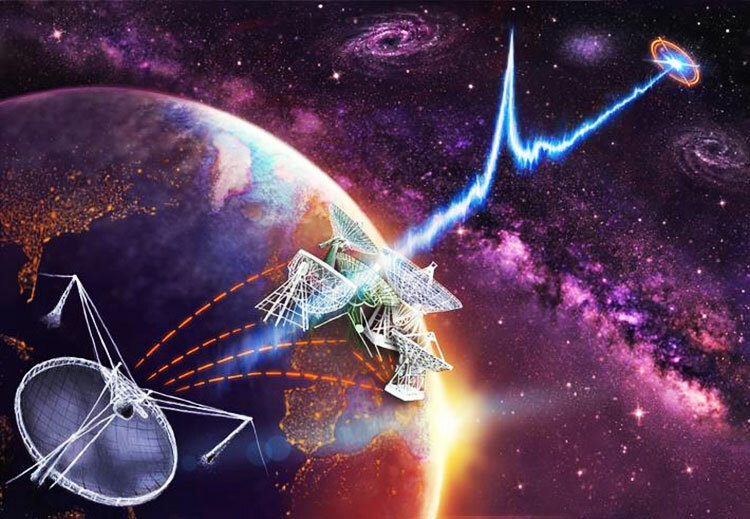 The enigmatic radio signal in question is called FRB 121102 (The Repeating Fast Radio Burst FRB 121102 - Multi-Wavelength Observations and Additional Bursts), and it was discovered two years ago by Shami Chatterjee of Cornell University's Department of Astronomy and his colleagues. This particular FRB was interesting because the signals broadcasted seemed to be repeated, which narrowed down the possible sources of FRBs. "We knew that it has to be some mechanism that is capable of repetition," Chatterjee explained to National Geographic. "It can't be neutron stars crashing into each other and destroying themselves or something like that." 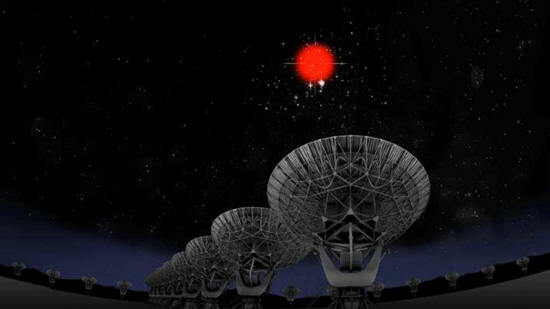 The team was able to locate the source of FRB 121102 using very powerful satellites. First, they dedicated all 27 of the 82-foot-wide satellite dishes at New Mexico's Very Large Array radio observatory to the task. After a period of six months that included 83 hours-worth of observations, the team managed to capture nine images of FRB 121102. Next, they used the powerful Gemini optical telescope to narrow the source of FRB 121102 to a dwarf galaxy about three billion light-years away from Earth. To confirm and verify these findings, the team took another look at FRB 121102 using a network of powerful European telescopes. It was then that, according to Chatterjee, FRB 121102 "went into hyperdrive," emitting bursts that repeated once every hour on average. 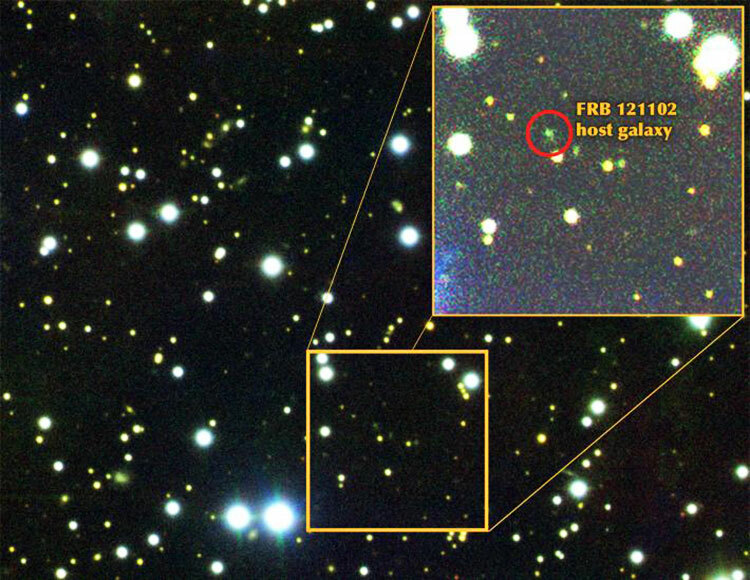 At that point, the team was able to pinpoint the source of FRB 121102 as the very center of the dwarf galaxy, which happened to be occupied by a supermassive black hole. This means that the fast radio bursts could be caused by the black hole itself, or they could be the result of something else near it, like the gaseous remnants of a supernova in the black hole or a neutron star orbiting it. One of the most interesting things about FRBs is that we have yet to detect any within our own galaxy. Because they only seem to emanate from places many, many light-years away, Chatterjee believes that understanding the phenomenon of FRBs can help us learn more about the universe's past. "One possibility is that it has something to do with the evolution of the universe," he said. "It's something that happened three billion years in the past, when the universe was slightly different than it is today. That's weird. It was going on three billion years ago, but not three million years ago?" Alternatively, we could be receiving evidence of local FRBs and dismissing them as interference caused by things like cell phones, satellites, and radar, which would mean the phenomenon is ongoing. Also, pinpointing a black hole as the source of FRB 121102 doesn't mean that all fast radio bursts are caused by the same conditions. There could be different kinds that we just haven't honed in on yet. In any case, further study is required, and as more information comes to light, we'll gain a deeper understanding of the universe in which we live.